From Star Ace Toys, comes the Evil Lord Voldemort as an amazing 1:8 scale collectible action figure from his look in the Harry Potter and the Goblet of Fire movie. 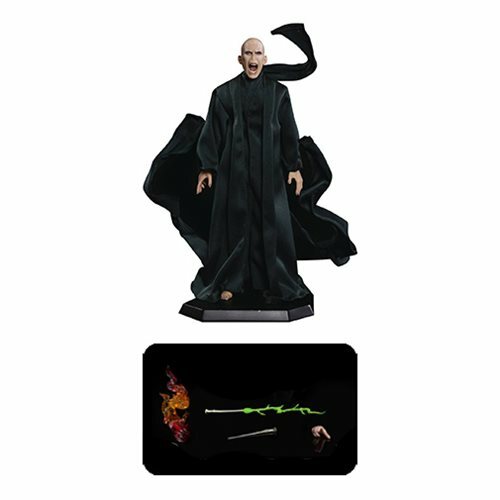 The Lord Voldemort 1:8 scale action figure features 30 points of articulation! The snake-like villain boasts an extra head, an interchangeable hand for holding his wand, his Dark Wizard's robe, his wand, the Elder Wand, fire effect parts, and a display stand! Measures approximately 9-inches tall. Ages 15 and up.